I'm having a minor setback bringing up the filename of the avatar I'd like. I've tried single-clicking on it, double-clicking, dragging the image over to the text area on my response screen, but nothing works. Your help would be much appreciated WGW. I'm sorry for the confusion with each image acting like a link. As with most things, right-click and select properties for information. I checked through the directory and I didn't see anyone with this avatar. If it's free, I would like it. ETA: Darn it, I looked in both those places and didn't see it. I know I've seen it somewhere, though, with posts beside it and everything, so I'm sure someone uses it. Andreth is the owner of that avatar (or something like it). That was it. Andreth requested it, and I think she may even have had it for a while, but now her posts are showing the same glowing white Lady Galadriel stepping toward the mirror-pool that she had when I first read RtR. Methinks confusing things are going on with the avvies, and that theory is backed up by the fact that donkey still has the same Saruman avvie as Peach Phoenix. A Refresh of the page should sort things out. If that doesn't work, force a refresh with CTRL-F5. Nope, Goldie's avatar has changed, but donkey and phoenix still have the same one. Bizarre, I see everything right. Did you refresh this page or the other page, because if you don't refresh the page where donkey's avatar resides, then you obviously won't be getting a fresh version of the file. Work with me people. That's weird. You'd think that refreshing one page would refresh the whole board. 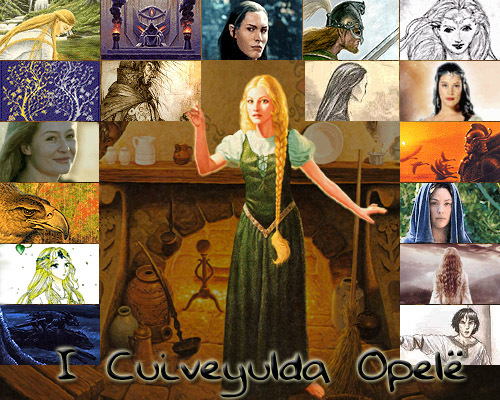 And I did say that I thought Andreth had used the Luthien avatar for a while... but it's Galadriel again where her posts are now. Yeah, that was definitely Andreth's avatar for quite some time. The one she currently seems to be sporting (with Galadriel) was the one she used before she'd found that image of Andreth, which became her new one. I don't remember her switching back. No, I think Andreth only requested it, but as avatars were not given out at that time, she never got it. In the previous giving of avatars, when Brae, Sherl, Eomer and I (and others) got ours, she wasn't around any more, so she couldn't ask for it and didn't get it then either. She came back in July, after WGW wasn't giving them out any more, and asked for it again. Are you confusing her with Sherl, who got hers? along with my first request for an avatar, which I never got, either. By the time there was finally a giving out of avatars, I had just found my current one, and asked for that instead. I do recall requesting it, but as has been mentioned, I've been away for quite some time now. I'm glad someone can enjoy it, as I still think it's rather lovely. Oh, right, I kind of remember now. It's funny how time plays tricks on the memory. Good to see you again, Andreth! I must've dreamt it then, because I do remember seeing the avatar under Andreth's name. Anyhoo, if Andreth is happy for it to be with someone else... No matter. I had posted a question for you in the discussion topic which you had posted above the Lit. forum on the home page. I was wondering where that went (since it is no longer there) and/or if you had replied to my inquiry. Uh... this is that topic. I just posted a link to it on the main page for everyone to see for a limited time. Uh... I believe I answered your question right after your post. I didn't see anyone with this avatar, so at your own leisure I'd enjoy seeing this little gem complimenting my MT alias. It's taken. Did you put the filename in the "Profile Keyword" search box? There shouldn't be any problems here, lest someone nabbed it as I typed this post. Sorry again, but someone already had the -A version of the file, so all other crops and versions of that exact image are also off-limits. The -A, -B, -C versions were offered for choice, but they are too similar to allow multiple people to have them. One day, an automated avatar system will remove all the sub-files from the list of choices automatically. Until then, pick again. P.S. You can leave the .gif on the search, and it will still work, so I don't know what you mean. Oh, of course, my blunder. Thanks! I missed this because I've been in Nippon for 16 days, carousing about. I'm glad to finally not be an "avatarless freak," I like the old school Nordic feel to it, and I like things related to water and the sea. I've always liked yours as well. Obviously anyone with a boat or ship as an avatar is in with the in crowd. Right, Inc'? Also, I notice some citizens, like Thorin for example, haven't chosen one and he's an old timer here. I wonder why. Just can't find the one that feels right? Kind of reminds me of the wood carving that is on the cover of The Legend of Sigurd and Gudrún, which I just started reading. The inside cover slip says they are carvings from the door of a 12th century church at Hylestad, Norway.